Want Windows in your Pocket? Dutch based company Ockel has recently introduced the Sirius A, funded by a successful Indiegogo campaign. Successor to the Sirius B of last year. 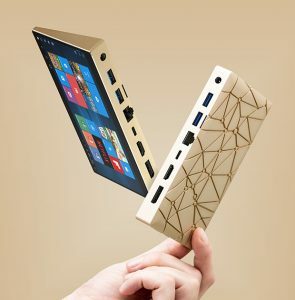 A Windows 10 device that fits like a phone in your pocket, with all the ports for a home PC. Ockel is looking to launch the device in May of 2017. The Sirius A features a six-inch 1080P touch screen display. The Sirius A plans to pack 64GBs of on-board flash storage, side ports feature microSD card reader, 2 USB 3.0 Ports, HDMI, DisplayPort, Ethernet and a 3.5mm headphone jack. The device is planning to ship with Windows 10 64-Bit so all applications you currently use on the desktop are compatible. The Mini Personal Computer features comparable specs to the latest phones and tablets such as an Intel Atom Quad-Core Processing unit, and 4GBs of RAM, built in Wi-Fi and Bluetooth. Ockel hopes to launch the device at $699 to match current smart-phone and tablet competition. Want to find out more? Follow them on their IndieGogo Page.